A guide to help battle a potentially fatal disease transferred by a blood-sucking insect called the kissing bug has been published by a task force led by The University of Texas Health Science Center at Houston (UTHealth) School of Public Health. 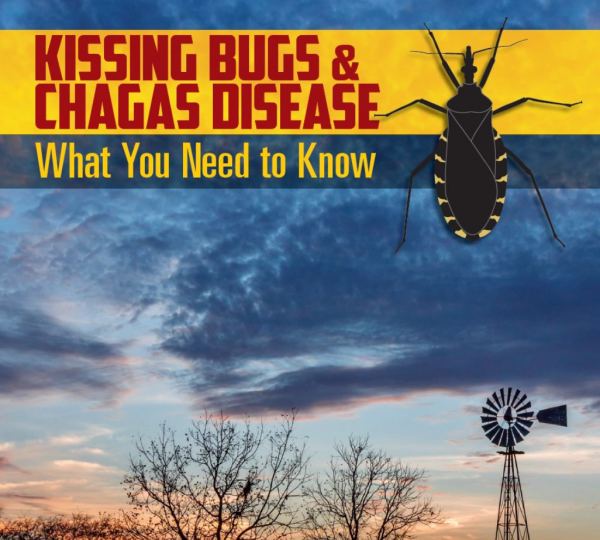 While it may not make good bedtime reading, the new image-based guide from the Texas Chagas Task Force could keep you from falling victim to a disease caused by a parasite that the kissing bug carries. The parasite is Trypanosoma cruzi (T.cruzi), and the disease it causes is called Chagas disease. It is dubbed the silent killer because its symptoms are so elusive. If caught early, Chagas disease is treatable but if left undetected and untreated, it can eventually lead to problems such as heart failure, an enlarged heart or stroke. Dr. Stigler-Granados wants everyone to be able to recognize the kissing bug and know that if they may have been bitten, or have been exposed to one, they need to tell their doctor and get tested. The hot summer months are peak season for kissing bug activity in Texas, she said. Chagas disease is estimated to affect more than 7 million people worldwide. Although most prevalent in Latin America, kissing bugs and Chagas disease can also be found in the Southern United States. Recent research has shown a high rate of kissing bugs infected with the T.cruzi parasite in Texas, amounting to 64 percent of captured insects in one study and 60 percent in a military study in the San Antonio area. Kissing bugs often bite victims around the mouth or eyes while they sleep, thus leading to its name. But in reality, kissing bugs can bite anywhere on the body. The disease is mainly transmitted through the feces of the insect, which gets into the bite wound. It can also be passed from mother to fetus and through contaminated blood products or even contaminated food or beverages. Once people are infected, there may be no indication of contracting the disease for years or even decades. For those who do develop symptoms, the disease can begin to affect the heart or digestive systems, at which point it can become potentially fatal. “This mysterious disease itself does not present with a lot of symptoms initially, if any at all. You may have a spot or a welt from the bite, or you experience mild flu-like symptoms,” Dr. Stigler-Granados said. “Ultimately Chagas can progress to the chronic symptomatic phase, which typically manifests itself as heart disease, although gastrointestinal disease is also possible. Around 20 to 30 percent of infected people will enter the chronic symptomatic stage of Chagas disease, according to the Centers for Disease Control and Prevention (CDC). The majority of sufferers remain undiagnosed until the chronic symptomatic stage, highlighting the need for greater awareness and early intervention. Physicians can prescribe a medication to treat Chagas disease in adults and children. The CDC can also assist with coordinating treatment using other drug options. Facts about the disease, maps and pictures of the multiple species of kissing bugs found in the Southern United States are featured in the comprehensive guide. Life-size young and adult insects are shown, pointing out their distinguishing characteristics. It also identifies look-alike insects, which don’t transmit the parasite, to help people rule out possible suspects. “If in doubt, you should take the necessary precautions and submit the insect for testing, which will not only assist with prevention but also surveillance of the disease,” Dr. Stigler-Granados said. Common kissing bug habitats, such as beneath porches, dog houses and kennels, chicken coops, and rodent nests, are discussed. Kissing bugs should never be handled with bare hands or crushed, due to the parasite’s presence in its gut. Clear guidance is provided on how to safely collect a suspected kissing bug and how to send it to be tested if suspected of biting someone and/or if found inside the home or if found outside the home. The guide was funded by a five-year $544,329 cooperative agreement grant from the CDC to conduct outreach and education on Chagas in Texas. More than 20 experts who are part of the task force, along with close collaboration with Texas A&M School of Veterinary Medicine and Biomedical Sciences, were involved in its production. Bring pets, such as dogs and cats, inside at night if possible or keep them in a place where they will not be exposed to insects from the outdoors. Check their bedding. Seal cracks or openings into your home, especially around windows and doors leading outside. Elevate woodpiles and keep them away from your home. Get rid of pests, such as rodents, living under or near your home in consultation with pest management professionals. Remove piles, excess leaves, and animal nests or burrows around your property. Keep chimney flues closed when not in use. July 19, 2018 "UMass Amherst Faculty Member to Lead Society for Pediatric and Perinatal Epidemiologic Research" July 19, 2018 "USF College of Public Health Professor Named Head of Sierra Leone EPA"